509 pages | 219 B/W Illus. Since the publication of the first edition of Multiphase Flow with Droplets and Particles, there have been significant advances in science and engineering applications of multiphase fluid flow. Maintaining the pedagogical approach that made the first edition so popular, this second edition provides a background in this important area of fluid mechanics to those new to the field and a resource to those actively involved in the design and development of multiphase systems. A quick look at the table of contents supplies a snapshot of the breadth and depth of coverage found in this completely revised and updated text. 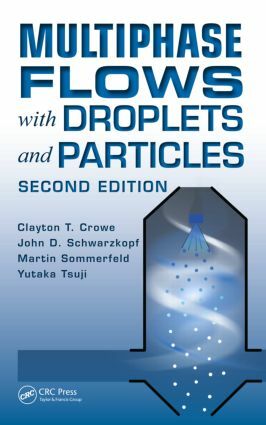 Suitable for a first-year graduate (5th year) course as well as a reference for engineers and scientists, the book is clearly written and provides an essential presentation of key topics in the study of gas-particle and gas-droplet flows. Clayton Crowe is Professor Emeritus of Mechanical Engineering at Washington State University. John D. Schwartzkopf is a Research Associate at the Los Alamos National Laboratory in New Mexico. Yutaka Tsuji is a Professor Emeritus of Mechanical Engineering at Osaka University, Japan.